" The following day would prove to be a dream come true for Marc when he connected with a superb trophy at the last minutes of shooting light which was just icing on the cake for this incredible week of hunting." Scroll down for the rest of the story. Click on pictures for a larger view. 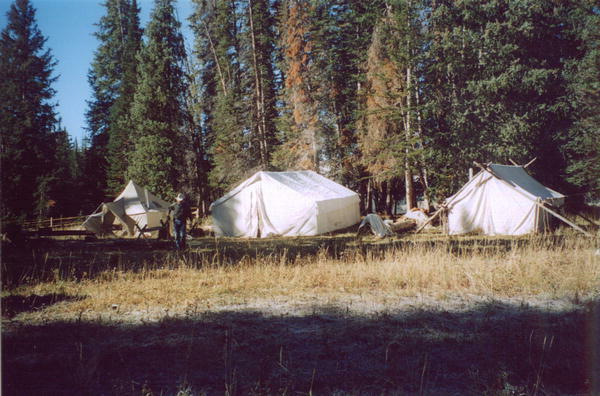 A true Wilderness hunting camp. Hunting camp: It never comes quite soon enough and then once you have been there for 3 straight weeks you cannot wait to get home to shower and to see the family. But then again in January you are daydreaming about what lies ahead for next year. My camps are always far far away from any telephone, vehicle or desk that could get in the way of a great time. Good guys, great cooks, a warm fire, spectacular scenery, and a sure footed mule are the ingredients that spell success in my book for a great hunting experience. I think it is a fever that you never quite shake and I have been asked by several people why do I do it? And more specifically why do I do it for other people? 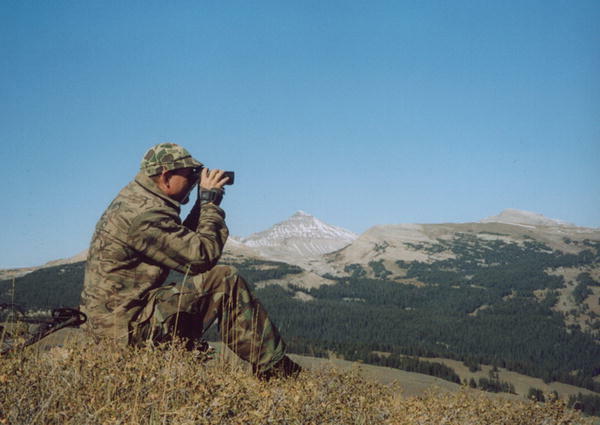 I am usually not prepared to answer the question off the cuff besides a few brief comments like, "I love the mountains," or "I get paid to do what I love to do," or "a bad day of hunting is better than a good day at work," but tonight I think I will ponder this question a little deeper. First and most importantly I give all the credit to our creator. The good Lord is, in fact, the one who makes this all possible. Without him there would be no hunting or mountains, or time to share with each other. I have been blessed with many things that make what I do possible and enjoyable. As I reflect on the past 12 years of guiding elk hunters in these mountains and the time spent with some of the finest folks you will ever meet I cannot help but think that the Lord has blessed me richly. So the question remains, Why do I do this for other folks? Why don't I just take 2 weeks and head to the hills and not look back? After all it would be easier, I assure you that. The answer might best be described in the events of this past year's hunting season. I checked the messages on my answering machine after arriving home from a long day at the office. 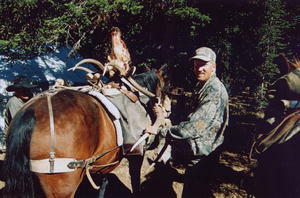 There was a brief but exciting call from Johnnie who was a past hunting client and great friend. He had given my name to a friend of his and told me to be expecting his call. 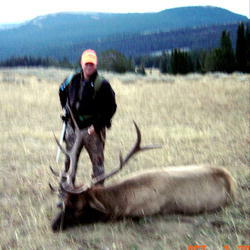 Marc called the next day fired up about elk hunting in Wyoming. You could tell from the onset that this guy was as sincere and honest as they come and definitely a guy you wanted in camp. Of course in Wyoming there are no guarantees on licenses and by the end of January I had Marc and his 3 friends in "the draw" for a Wyoming elk hunting tag. I could hardly get a word in edgewise when the draw results were posted on the internet and Marc called with the exciting news of his party's success. It was a life-long dream of theirs to come to the Rocky Mountains in pursuit of the majestic bull elk and it was quickly becoming a reality. Seven long months would pass and every possible scenario would run through the minds of these four hunters. And as they prepared both mentally and physically for one of the greatest trips of their lives, I was gearing up for nothing short of the same thing. There are several arrangements that have to be made during the off season and I had my work cut out for me. Todd Nethercott, one of my best friends, owns the outfitting business known as Black Diamond Outfitting whom we operate through. He has first class equipment and an excellent hunting area. The next obstacle was to find the guides who would be working the hunt. Todd's Dad, Jim, was first on the list with his years of experience guiding in this same area and like any outfit there is wisdom in the grey hair. Dallen was next on the list, not because I think he is an excellent hunter (although that is a true statement) but because he is an engineer and every hunting camp needs an engineer. I could not leave out one of my other best friends so I called up Casey. He too was not chosen because I think he is an excellent hunter (although that is also a true statement) but because he is the best custom home builder you will ever meet and every hunting camp needs a carpenter. I would of course qualify as the fourth guide because every hunting camp needs a realtor (you will find out why, later). Next on the list of important employees needed for the trip was a good wrangler and packer. I had no choice for this position because I just called the best. Amanda would prove again why she gets my call for the duties of camp chores, tending to the horses, and hauling meat and hunters to and from camp. Last but certainly the most important member of the crew was the cook. You all think that hunting camp is full of Kipper Snacks and Ritz Crackers but I am here to tell you that a day does not go by that I don't think about Dutch Oven Peach Cobbler or Wagon Wheel Eggs and Rhonda gets my vote as the best and tallest camp cook west of the Mississippi. I was all crewed up and ready for the month of September to roll around when we would set up camp and scouting would begin. This year I invited another great friend, Tom, and his fine mule string to assist us packing in camp which was a huge asset. 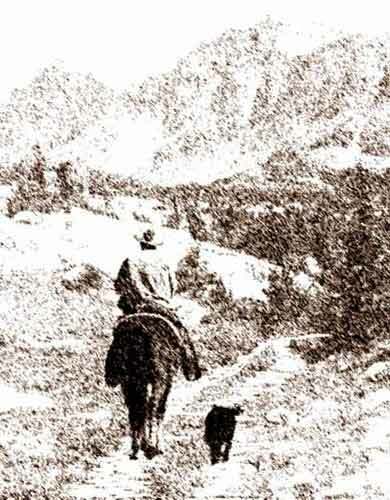 My father was also along for the ride which was cherished by me since he doesn't get away from the ranch much. Todd and his dad would team up for another father son duo and our trusty engineer, Dallen would round out the crew for a 3 day endeavor of recreating the Old Snook Moore Hunting Camp. 16 pack mules, 6 handy guys, and a whole bunch of Buffalo Jerky was all it took to complete the task and we were ready for hunters. Experienced guide Casey Saxton glassing for big bulls. Scouting began two weeks later with the help of Casey, Dallen, Tom, myself, and one of the other greatest cooks west of the Mississippi, Tom's wife Carol. She is a far shot shorter than Rhonda (Rhonda is six feet tall) but man can she cook. You even have to fight her to do the dishes which I lost nearly every time. Four great days of scouting was all it took to convince me that we were ready for an amazing hunt but I hated to go home. Not only was the food out of this world but Tom was giving Amanda a run for her money with camp chores and had even favored us with a fire in our tent every morning before breakfast. It was like being on a fully catered hunt. The only thing better was if he saddled my mule too but I think that would have been pushing my luck. The hunters arrived as scheduled and planned a day of sightseeing in Jackson Hole along with a trip up to the gun range for a few last minute adjustments. We were headed to camp the following morning with four wide-eyed hunters who were trying to take it all in. I have to admit that a group of hunters such as these who have dreamed all of their lives for a trip such as this are truly fun to be around. Everything to them is a big adventure including the two-hour ride into camp. When we arrived to what I consider to be deluxe accommodations for a wilderness wall tent camp we still had plenty of time for a few last minute chores. The horses and mules were grazing in the meadow, supper was on, everyone was unpacked and the bull elk were bugling across the valley. It was a sight to behold. The anticipation was building and we were in HUNTING CAMP! Chris' bull broke the ice of an eventful week of Hunting Camp. Long before sunrise Rhonda was creating a magnificent feast, Amanda was gathering up the critters and the guides were strategizing for a full day of hunting. The hunters were finally roused, which was an extremely easy task since it appeared that no one had slept a wink. As the sun was slowly making its ascent on the east side of the Rockies we had also begun to close the distance between us and the bugling bulls. Casey and I had teamed up with Marc and Mark for the day's events and it would prove to be nothing short of eventful. Close calls and big bulls that got away would be the stories told around the campfire that night but great stories were all to show. 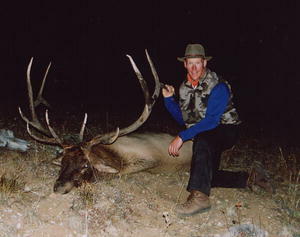 Dallen and I teamed up for the next morning and headed into some country where I had spotted elk the night before. Our first elk would be harvested by his hunter Chris just a few minutes after shooting light and we had broken the ice and had meat in the freezer. More close calls and a couple missed shots would take up the rest of day 2 and day 3 but there was plenty of time left. The following day would prove to be a dream come true for Marc when he connected with a superb trophy at the last minutes of shooting light which was just icing on the cake for this incredible week of hunting. Day 5 was beginning to takes it toll on my hunter, Mark, with nearly every day an extreme physical workout as we seldom took the horses. My experience as a realtor would prove to be beneficial nearly every night as we walked back to camp with such salesmanship tactics as "camp is just over the next ridge" and "it is all downhill from here." Again on this final day of the hunt we experienced another disappointing close call and settled for an early arrival back to camp for lunch and a short nap. With a few hours of daylight remaining we decided to head for a meadow across the valley that had produced several sightings of elk. Settled in the center of the park in a group of pines would prove to be the spot for Mark as he connected with a very respectable 5 point bull just before dark on the final night of the hunt. Jim and his hunter John hunted hard with multiple bulls breathing down their necks with just one too many pine trees in the way, but that is why they call it hunting. Although to many people the success of a hunting trip is measured in the size of the trophy that they take home, I can honestly say that for me, and for many of my hunters over the past 12 years, that is not the case. The time spent in preparation and thought for that once in a lifetime opportunity, the incredible lifelong friendships you create, the freedom that we have from our jobs to enjoy such adventures, our spouses that stay at home and take care of our children and household duties, the hard working and competent people that we share these trips with, the safety from harm that we are so often blessed with, and the magnificent country where these trips take place can all be classified as PIECES to a successful hunt. When you put all these PIECES together just like took place this past fall you have the makings of the most memorable experiences of your life and that is why I do what I do. I hope to see you in Hunting Camp someday soon and rest assured, it is always OFF THE PAVED ROAD!